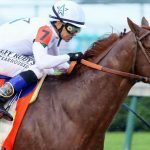 Amarillo, Texas – June 13, 2018 — Jockey Mike Smith was wearing a new type of high-tech silks in all three legs of his 2018 Triple Crown bid. Speed Silks® brand jockey silks are made entirely of an aerodynamically-engineered, patented technical fabric that’s already used in speed sports like cycling, speed skating and downhill skiing. 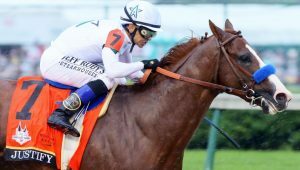 WinStar Farms —whose colors Smith wore aboard Justify in the 2018 Kentucky Derby (G-I) and Preakness Stakes (G-I)— has been buying and using Speed Silks since the spring of 2015. 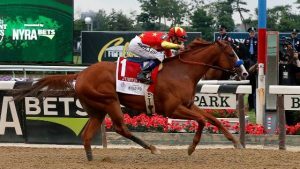 China Horse Club became a customer in the spring of 2017; Smith wore their colors in his 2018 Belmont Stakes (G-I) win. The 2018 Triple Crown wins are the latest in a number of very high-profile wins by jockeys in Speed Silks. Since the product launched in August 2013, Speed Silks have been on the winners of two Kentucky Derbies, two Preakness Stakes, two Belmont Stakes and one Breeders’ Cup Classic (G-I). Speed Silks were designed from the ground up with two priorities: reducing aerodynamic drag, and jockey comfort. A key to both is the patented technical fabric Aero Dimplex®. The textile is dimpled —much like a golf ball— which reduces both form drag and skin friction. [Darby can explain both at length; his contact information follows.] It also allows the use of dye sublimation to apply the colors and markings of each owner’s specific silks; that eliminates the need to sew the markings piece-by-piece. Instead, they are dyed directly into the fabric. Built with a form-fitting pullover design, Speed Silks are entirely seamless, further reducing weight and drag. Aero Dimplex is thin, very breathable, moisture-wicking and very stretchy. “Regarding comfort, jockey feedback has always been overwhelmingly positive,” Darby adds. Speed Silks this summer will add a new feature to its products: Coldblack®, a patented textile treatment that blocks and reflects ultraviolet light, keeping the garment and the wearer cooler in the sun. Previous major wins in Speed Silks include 2014 Breeders’ Cup Classic winner Bayern (jockey Martin Garcia/owner Kaleem Shah), 2016 Kentucky Derby winner Nyquist (Mario Gutierrez/Reddam Racing), 2016 Preakness Stakes winner Exaggerator (Kent Desormeaux/Big Chief Racing) and 2017 Belmont Stakes winner Tapwrit (Jose Ortiz/Eclipse Thoroughbred Partners). Darby’s inspiration to build better silks came at Turf Paradise in Phoenix, Arizona. He had just accepted a marketing position at the American Quarter Horse Association in Amarillo, Texas. Most of his work was on behalf of the racing department, and so the Association regularly sent him to tracks across the country. During his visit to Turf Paradise —the first horse race he had ever attended— he asked a co-worker why the jockeys were wearing such baggy silks. “So, once I was convinced the concept was valid, I got to work designing the first round of prototypes. I had the help of a Quarter Horse jockey, G.R. Carter, Jr. He was the biggest name in the business at the time, but that’s not why I picked him; he was the only jockey I knew personally. He was incredibly helpful and made the perfect “model” jockey. Plus, he’s a bit larger than your average Thoroughbred jockey, and I’d rather the silks be a little too large than a little too small. They need to be form-fitting without restricting movement,” Darby says. Speed Silks are available in two sizes: Regular and Large. Regular is the default size for North American jockeys. The first set of Speed Silks was sold in August of 2013 (to Wes Melcher’s Double Infinity Ranch). Two important things happened quickly: Bob Baffert’s office called to order Speed Silks for a couple of their owner-clients, and the Australian horse racing retailer horsefabulous inquired about representing Speed Silks in the Asia-Pacific region. “So right away, we had one of the biggest names in the business buying our stuff, and we get a foot into the Asia-Pacific market,” Darby says. Both of those relationships are going strong today. Speed Silks are patent-pending. The product lineup includes silks jackets, racing helmet covers, jockey pants and boot sleeves – a product unique to Speed Silks. 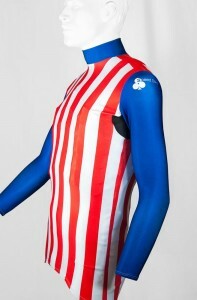 Examples of the product can be seen at SpeedSilks.com/Gallery. Matt Darby is available for comment at (806) 570-6920 or MJDarby@me.com. Customers wishing to inquire about Speed Silks can e-mail info@SpeedSilks.com or call (806) 333-8589. Asia-Pacific customers e-mail info@horsefabulous.com.au. Mike Smith is his name. All of us with any reasonable amount of activity in the world of horse racing know of this native of New Mexico and of his success. With all of that said it is easy to understand why he did what he did. 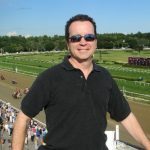 At the recent Charlestown Classic (Grade II) Smith pulled up his horse about halfway around the track. He was aboard the great gelding and probably the best horse in America, Shared Belief, who was the odds-on choice in the race. I remember watching the race on my computer screen. I told my wife Shared Belief didn’t finish the big race. She gets upset when a horse is hurt. She first cringed while standing at the stove preparing dinner. “What happened,” she asked me with a fearful look on her face. I told her I wasn’t certain but it looked like Smith pulled up his mount and that Shared Belief appeared to get into the van without much difficulty. I told her that Smith probably thought something was wrong and immediately put a stop to the proceedings. I told her not to worry because Smith was going to take care of his mount. It turns out Mike Smith’s intuition was right. The Hall of Fame jockey likely saved multiple grade I winner Shared Belief from further injury by pulling him up in the Charles Town Classic (gr. II) April 18, as diagnostic work performed in the following days revealed a non-displaced fracture at the point of the gelding’s right hip. Since then we have learned that Shared Belief will get a vacation for a few months to recover. He is going to be fine and, as I understand it, we may even see him run again this year. This entire story about Shared Belief centers on the unselfishness, professionalism and perfect ethical conduct of Mike Smith. The old pro didn’t think about money, glory or anything else. He thought something was wrong with his horse and immediately did the right thing. Smith risked being wrong and risked plenty of embarrassment, which would have hurt his business. That didn’t stop a good man from doing what is right. Mike Smith took care of his mount. Our sport is often subject to controversy. Our sport has the chemistry for some bad things to happen and it is a difficult sport to police. There are medication controversies and occasional unethical or illegal activities by trainers and jockeys. It is sad for what happened to Shared Belief, but since it did happen I can say I’m glad Mike Smith was in the saddle. And Shared Belief is glad he was in the saddle too.